My Funny Dessert’s ascension to worth-the-wait status has been a year in the making, and that is something of a miracle given the shop’s hard-to-find location and utter lack of a phone number. 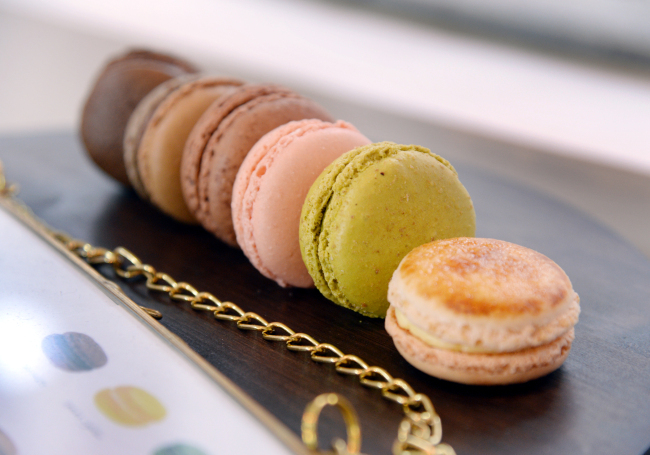 Situated on a small street about a 10-minute walk away from Hanti Station in Daechi-dong, the three-seat nook was originally meant to be a pastry and sweets atelier, but opened as a tiny French dessert shop last February. 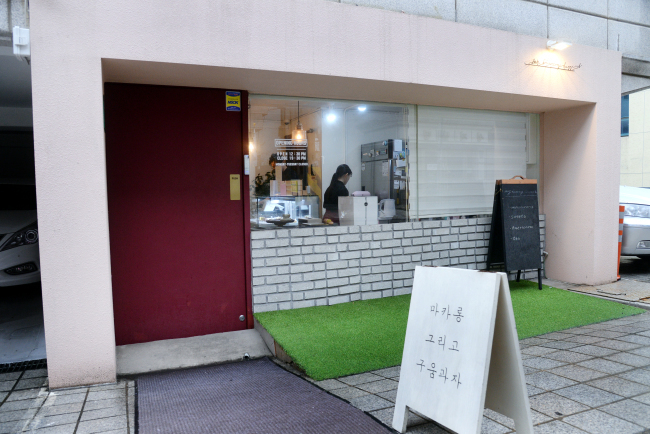 “Our first-time customers would come back with more people,” said co-owner and pastry chef Kang Suk-gi, recalling that despite the absence of a phone number and sequestered location, a growing base of regulars helped spread the word. Not even an hour after opening on a weekday, at 12:30 p.m. customers trickle in, snatching up a seat if possible and ordering a slew of treats with the familiarity of people who have munched on one more than once. Some willingly wait for a seat, if none are available, in order to enjoy one of Kang’s scrumptious sweets. The lineup is varied. There are madeleines, custardy dark rum and vanilla-infused caneles, macarons, meringues, and what are quite arguably My Funny Dessert’s most popular treats, Kang’s tarts. The tarts -- sumptuous, carefully structured and elegant -- were added to the lineup in October. Now, Kang’s two original tarts -- a vanilla tart and a hazelnut-matcha tart -- almost always sell out. The vanilla tart is a sophisticated study of the various conduits through which Kang can maximize the fragrant, rich headiness of vanilla, from a thick, creamy ganache crafted with both Tahitian and Bourbon vanilla and white chocolate, to a top layer of mousse crafted with fresh cream, Mascarpone cheese and vanilla, to the final garnish of grated vanilla over the whole affair. The resulting rectangular treat is lush and decadent, buoyed by an uber-thin, buttery tart shell and a bottom layer of almond-rich joconde sponge cake. Then there is My Funny Dessert’s hazelnut and matcha tart, a combination first suggested by Kang’s wife -- who opened the shop with her husband -- in the form of a macaron. 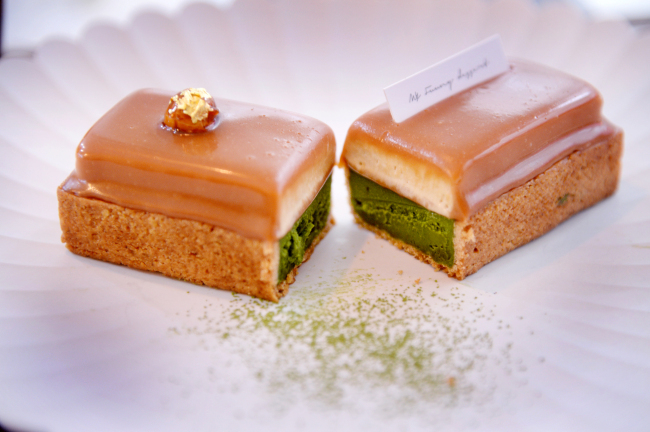 After Kang paired matcha and hazelnut in a macaron, he created an elegant tart, beautiful to look at with its vibrant emerald and beige layers, where the intense bitterness of matcha joconde sponge cake and matcha ganache acts as a foil to the sweet, creaminess of hazelnut mousse and hazelnut caramel, and a single caramelized hazelnut that tops the tart. Kang recently added two more tarts to the lineup and is planning on adding more along with other new treats. Are there also plans to finally add a new phone number? Kang says not likely, adding that he feels their Instagram account is an effective way to update followers on what is going on at My Funny Dessert.